Zoo authorities had placed suggestion boxes inviting names from visitors and received 400 suggestion with 30 suggesting Baahubali. BHUBANESWAR: Nandankanan Zoological Park here has got its own ‘Bahubali’. Thanks to recommendation of visitors, the zoo authorities have named one of its cubs after the SS Rajamouli blockbuster movie. 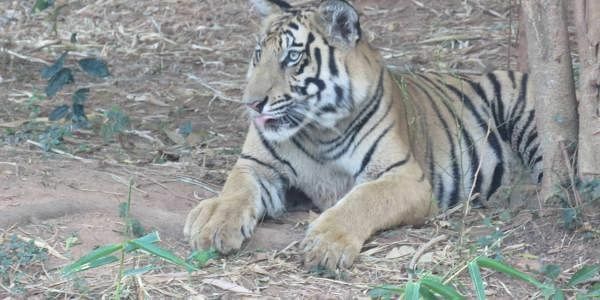 Seven cubs which were born to three pairs of tigers were to be named basing on suggestions made by visitors. On Tuesday, the zoo authorities placed two suggestion boxes inviting names from the visitors. They were chuckling at the end of the day when they saw the outcome. ‘’We received more than 400 suggestions of which more than 30 suggested Bahubali while an equal number recommended Devasena,’’ said a Zoo officer. In the film, the character Devasena, played by Anushka Shetty, happened to be mother of Bahubali which was played by Prabhas. Actually, Prabhas had a double role in the film in which he played Amarendra Bahubali and son Mahendra Bahubali. While the original and the sequel have been run-away hits breaking box office records, its popularity with visitors prompted the zoo authorities to respect their suggestions. On Wednesday at a formal function attended by Forest and Environment Minister Bijayshree Routray, the names were announced. The cubs of Nandan and Megha have been named Bahubali and Kundan whereas the off-springs of Bijaya and Roshan were named Sahil and Adyasa. The three cubs from the second litter of Sneha, who was paired with Manish, have been christened Vicky, Mausumi and Chinu. Of the seven, five are male. One of them, Vicky, is melanistic. On the day, the Minister also unveiled a Baby Care House constructed by the zoo near the OTDC canteen. The 270 sq ft room has facility for mothers to nurse their children. ‘’We have provided sitting areas for women to breastfeed their children. Wash basins are also constructed. It is a woman-only facility,’’ an officer said. Two reverse osmosis water plants for supply of safe drinking water to visitors were also inaugurated in presence of Director Sisir Acharya, Deputy Director Jayant Kumar Das and Assistant Director KL Purohit.